How about that time pun in the title, folks? Hey man, your Willis is showing. The Plot: The year is 2044, and time travel has not yet been invented, but in thirty years, it will be. In the future (of 2074), forensic science has become so advanced that it’s nearly impossible to dispose of a body, unless you’re a super-wealthy crime lord and can afford a super-illegal time machine, in which case you grab a guy and blast him back in time to 2044, where Joe (Joseph Gordon-Levitt), a “Looper,” or what I’m going to call a Time Assassin, will kill him for you. Joe lives a happy life of murder, drugs, and strippers until one day his future self (Bruce Willis) is sent back and Joe is unable to complete the kill. Stuff gets crazy and the visual effects budget skyrockets as Joe and Old Joe take turns being the antagonist, Joe’s boss in the present tries to kill everyone, and Old Joe tries to kill the crime lord of the future today. Time Assassin Joseph Gordon-Levitt. That face? One of his targets appeared in a shirt that was almost funny. Time travel is, in and of itself, a plot hole. Just one, big, glaring plot hole. Should you write a time travel story for your screenwriting class because you think you’ve figured out the perfect way to do it without plot holes? No, you shouldn’t. If Rian Johnson, the writer/director of Looper couldn’t do it, then I am positive that you can’t do it either. So, why am I bothered by the fact that Looper, like every other time travel movie, has a few massive plot holes? The words time travel, as soon as they are spoken (and in Looper I’m pretty sure they’re the first two words of the film), should automatically suspend everyone’s collective disbelief. But darn, I went in expecting Johnson to pull it off, and I shouldn’t have. That was my mistake, not his. In fact, a couple different characters tell Joe flat out to not think too much about the logistics of time travel, because it will never, ever make sense. I should have listened. Oh well. If the plot holes inherent to time travel were the only problems I had with this movie, we would have been good, but alas, I have (pause for counting) one more problem. Rian Johnson is super good with characters. That’s his thing. So having characters act inconsistently or uncharacteristically is, for him, uncharacteristic. That’s what kind of happened in Looper. We start out with two Joes. Both Joes want to ensure a good future, clear of having to murder people for money. Old Joe wants to kill this big bad boss man in the past to ensure that his wife will live in the future. Joe wants to retire early and spend several years doing drugs, eating good food, and nailing strippers. Sounds like Old Joe has better motivation, yeah? We sympathize with him quite a bit more… right up until the point where we realize that this big bad boss man is a child. Old Joe wants to straight-up murder children to save his wife in the future. That… kind of goes against what we know about him at that point in the movie. He’s settled down; he wants to stop killing people; he wants to have a child of his own someday; he’s supposedly become a good person after marrying his wife; his past self is in no way okay with killing children. The really weird thing, though, is that Joe offers his future self a few other perfectly reasonable solutions to his problem, but no, Old Joe just wants to murder children, because that’s never a horrible, unjustifiable thing to do. 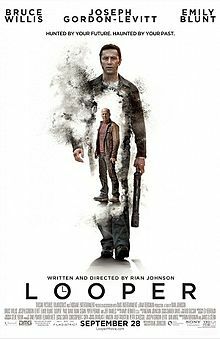 Johnson goes in with an aim for ambiguity and nuance, but ends up with a very clear, black and white, Bruce Willis wants to murder children and Joseph Gordon-Levitt wants to stop him from murdering children situation. This isn’t exactly a moral dilemma. Negative criticism aside, the performances are excellent all around. 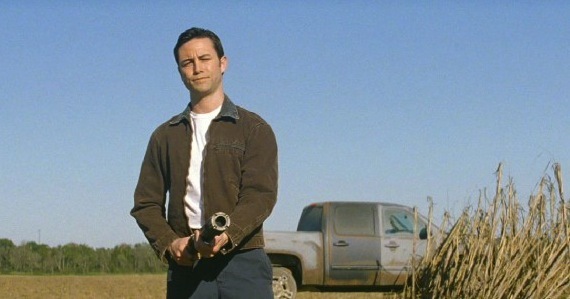 JGL in Willis makeup gives a spot on Bruce Willis impression, but because he’s such a good actor he doesn’t stop there. At the end of the day, he’s Joe, not Willis. Willis himself also gives an excellent performance, playing an antagonist whose desires outweigh his morals, but who feels guilty about that. Also in a major role is Emily Blunt, skillfully playing the mother of the child that JGL is defending. She brings a much-needed heart to the film, and really ends up being the character we like most. This is what heart looks like in the future. Also excellent is the original score, provided by the great Nathan Johnson, cousin of Rian. Normally I would refer to these people by their last names, but since these two share one, I will refer to Nathan Johnson as DJ Whirligigs. Why? What does that name have to do with anything? Am I making a clever reference? No. Ladies and gentlemen, DJ Whirligigs. 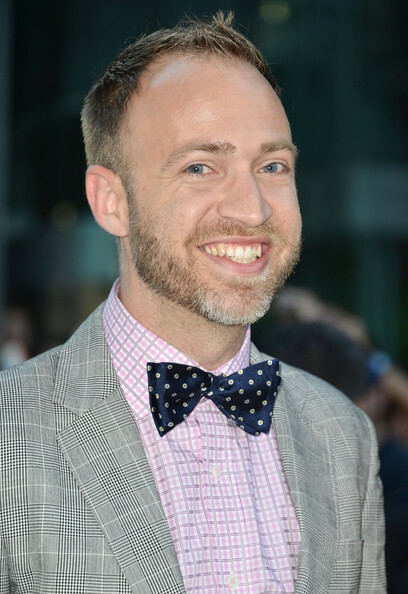 DJ Whirligigs has provided consistently excellent soundtracks for both of his cousin’s previous films, Brick (2005) and The Brothers Bloom (2009). With Looper, DJ Whirligigs strikes an excellent balance between bombastic futuristic percussion and nostalgic, quiet melodies. In creating the percussion part, DJ Whirligigs did not use traditional instruments, but instead went out into the real world and took recordings of common sounds: car doors, engines rumbling, and all of the sounds that guns make. Then he mixed them all into some real neat music… just like someone named DJ Whirligigs would do, right? That sounds right. Yeah, see? I totally had a reason for renaming Nathan Johnson DJ Whirligigs. I just didn’t know it at the time. I really did like this movie, but I didn’t love it. It fell short of my incredibly high expectations. Comparing all of Johnson’s films, Brick is best; The Brothers Bloom has the most heart; Looper has the best performances. Looper got really good reviews, which is great, because Rian Johnson is an extremely talented guy, and I hope this film opens up a number of creative opportunities for him. Rest assured, I am very much looking forward to Rian Johnson’s future projects. I still don’t get why time travel bugs you so much. I mean, any science in movies is usually a plot hole. Not trying to explain it is really the only way to make it work. Also, Old Joe is desperate and broken by the loss of his wife. He doesn’t act out of character. DJ Whirligigs is the best name for a musician. I hope that it’s Nathan Johnson’s nickname in real life. I say that it was my fault that the time travel bugged me, not his. Also, there’s a difference between being desperate and broken and being willing to murder children. Yeah, I know. Just sayin’. And is there? The children murdering thing was kind of a “would you kill baby Hitler” situation, but with a dash of “Hitler is responsible for your wife’s death.” That having been said, I don’t think you’re wrong for not liking it. It didn’t work for you. Your criticisms are valid! Vaaaaaliiiiid! First mention of Hitler. Argument over.